Join us as children of all ages are challenged to seek the greatest treasure ever known to man, God's word. Each exciting night is packed with awesome games, fun prizes, stirring songs, and challenging lessons. Every week your child will be challenged to learn an important truth about God along with a verse of Scripture to back that particular truth up. Throughout the span of a child's time in Treasure Seekers they will learn about God's word, God's greatness, God's goodness, God's triunity, God's creations, God's view of mankind, God's law, God's Son (Jesus Christ), God's gift of salvation, God's purpose for His children, and God's work (past, present, and future). First Time: When you arrive, you and your child will be greeted by a leader that will help you through the registration process, find or provide answers to any questions you may have, and direct you to where you will need to go. If you haven't registered on-line you will be asked to fill out the front of your child's entrance booklet at registration. Week to Week: Your child will still need to check in so we may record that they are with us and can record any points for their team. Each night begins with a focused time as your child is encouraged to participate in quoting our theme verse (Colossians 3:1 - If ye then be risen with Christ, seek those things which are above, where Christ sitteth on the right hand of God. 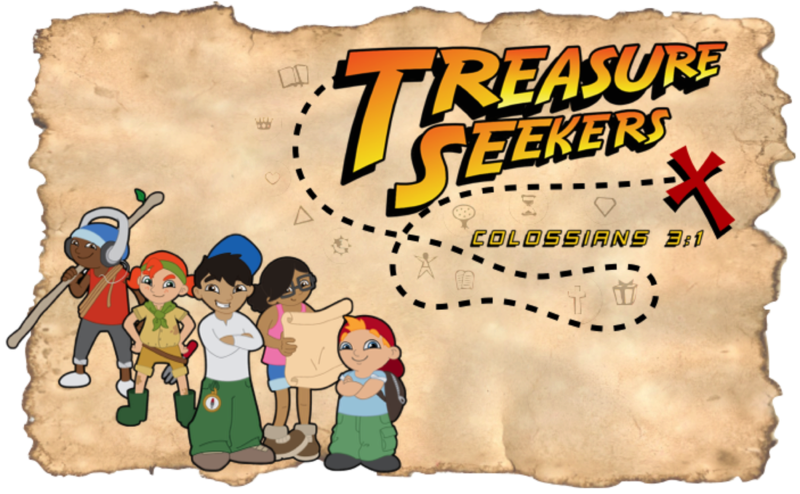 ), sing our theme song "Treasure Seekers", and a song that reinforces the doctrinal truth being taught. After any special announcements your child will move on to the events of the evening. Story Time: Through an engaging and interactive lesson, your child will be taught a lesson pertaining to the subject they are working through for that particular quarter. Game Time: Through energetic and fun competition, your child will learn the value of teamwork and good sportsmanship (they might even be a little tired when they come home!). Book Time: Through personal study, your child will be encouraged to memorize scripture and understand it's application to their life. It is during this time that they are encouraged to share what they have accomplished with our trained leaders as well as begin to work ahead on their next challenge. After completing their entry booklet, your child will be awarded their very own Explorer Sack and First Explorer Book. Each week your child brings their Explorer Pack, Explorer Book, and Bible they will earn points for their team. After attending 3 weeks of Treasure Seekers and accomplishing 2 of the units in their first book, your child will receive their very own Treasure Seeker Uniform. Your child will be encouraged to wear their uniform to every night of Treasure Seekers as well as at their Sunday Night Performances. Each time they wear their uniform they will also earn points for their team. Your child will be awarded Treasure Seeker Bucks for every point they earn (attendance, wearing their uniform, passing stages, bringing visitors, good behavior, etc.). At the conclusion of the night they will be able to spend their Treasure Seeker Bucks or save them up for a larger prize.